Eighteen some months ago, Josh and I became the proud parents of The Baby. An infant. A tiny human who only thought about food, sleep and poop. Because of his apparent helplessness and tendency to use tears to communicate, we aptly dubbed him “The Baby”, as in, “What is that Baby doing?” when the house falls eerily quiet, or “Is that Baby going to be in his diaper all day or are we going to clothe him?” The Baby has been a Siders’ House staple for quite some time, and we’ve grown fond of him. But during the past month or two, a very sad thing happened in our house. The Baby left. There are still diapers, there is still crying, there are still tired, sunken in eyes in my head some days. But The Baby, he’s gone. Today, there is a Big Boy in John’s crib, a boy with slimmer thighs, longer curls, and a much more childlike, not baby-like, face. This new little person is capable of running (into the street, gasp!) and sharing his desires with words, actual words. He can shimmy up and down furniture while stashing a toothbrush in his mouth and an electronic device in his hand. If it weren’t so death-defying, I’d be impressed. 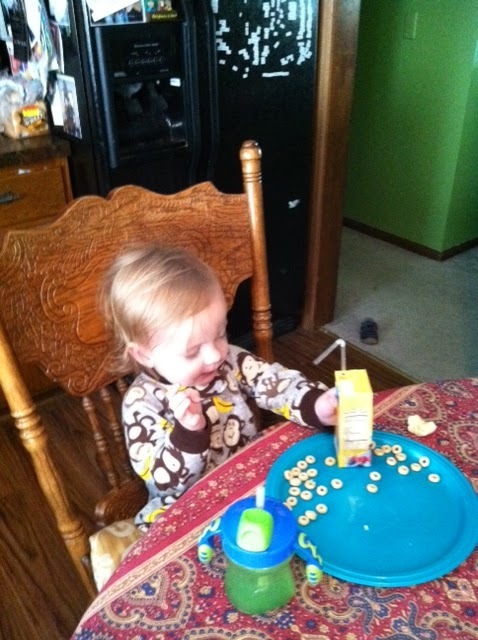 The Big Boy, with Big Boy Juice and a Big Boy plate, sitting at the table. Now there is a bit more noise in the house. It’s the sound of me asserting my authority over the din of the Big Boy’s strongly-held beliefs about his Constitutional rights. Although it’s hard to make out the amendments over the screaming. Just to be safe, and so as not to draw attention from the child protective authorities, we call this Big Boy, “John”, although the resemblance between him and his helpless, infantile self can hardly be recalled. Except in pictures. 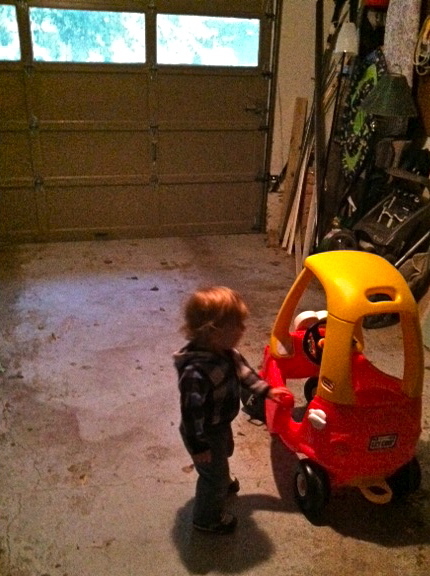 When Dad’s gone, we let John park his car in the garage. Saying bye to Baby has been a rough transition for me. I enjoyed calling him The Baby for so many reasons, partly because the generic title made me chuckle, but also because he will forever be “My Baby” and calling him something else, like a Big Boy, meant growth, meant driver’s licenses and curfews and college. Can. Not. Handle. It. The Big Boy enjoys a variety of artistic endeavors, but he’s really putting most of his focus into music and dancing at this point. He can scarcely be around rhythm without moving and shaking to it. Here he is with his latest choreographed piece by Jock Jams, “Ya’ll Ready For This.” My sister, Holly, is also an experienced dancer and selected this piece for the performance. Enjoy. I'm sure John loves his Aunt Holly and all the fun things she teaches him. What a cutie. I feel like him and Anna could get into some major trouble together. Love that we both have lively toddlers with strong wills. The strong willed fight against injustice. Just need to learn to curve their wills not break them! Someone told me that recently and I was very encouraged. Oh yes, Aunt Holly has much to teach John. They are pretty cute. Don't you love her shimmy toward the end? Makes me laugh? I like your quote about "curving" their will. That's really good. I've thought about that more recently too, about how all the energy and anger or whatever can sometimes be channelled toward silly things when God wants to do something great with them. I know we're equipped to curve that will toward world impact, right girl? I loved this post. I have been looking at Sarah lately and wondering where our little baby girl went to. But then I see the big girl we have now and how her personality and yes even her strong will are blessings to us. But it's always bittersweet when the littles get bigger! I was so sad that Andrew had some teeth pop through at 3 1/2 months because he looked less baby with all those chompers.